In our most recent refresh of this top straps article, we completely overhauled our chart by selecting eight new straps that consistently deliver quality and value for money. These included the nicely padded KLIQ AirCell strap and the Cavalry Straps Ultimate Leather strap, as well as the popular budget Protec guitar strap. 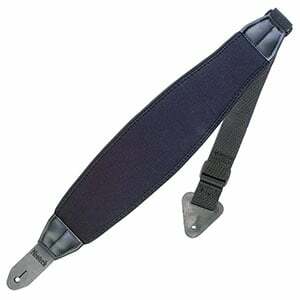 In addition to the actual guitar, amp and lead, the most essential tool for any guitarist is a guitar strap. And, while buying a strap shouldn’t require weeks of consideration, there is still plenty to look out for. What are Strap Locks and Locking Straps? That is why we have highlighted eight of our favorite stylish, practical and affordable straps – suitable for electric, acoustic and bass guitars – in the chart below, before taking a look at what you should consider when purchasing a new guitar strap. Let’s get started! Optimum comfort for the serious stage performer. A comfortable leather strap with a great sense of style. Stylish strap with innovative locking ends for ultimate security. 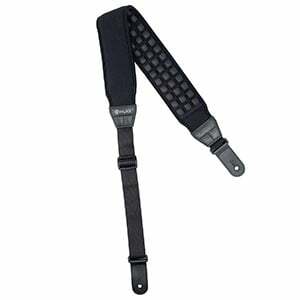 An American-made strap that helps reduce shoulder strain. Eco-friendly seatbelt strap with full adjustability. An affordable extroverted strap with attitude. 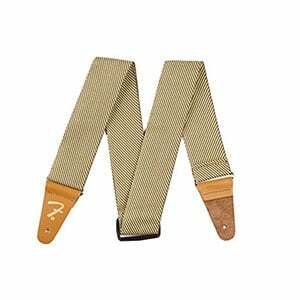 A comfortable Fender strap for the vintage enthusiast. A quality budget strap that is great for beginners. Topping our chart is this exceptional strap from KLIQ, which uses an innovative 3” wide neoprene shoulder pad featuring several rows of individual soft ‘air cells’ (little pillows). This helps evenly disperse the weight of the guitar across your shoulder, leading to extremely comfortable prolonged performances. It’s fully adjustable (from 46” to 56”) and has genuine stitched leather ends for a secure connection to your guitar or bass. Ergonomics aside, it features a sophisticated all-black design which would suit all styles of stage performer. It’s not the cheapest strap, but worth every cent. Just like the strap above, comfort is the name of the game when it comes to this leather strap, which just oozes quality. For a very reasonable price it also offers top-notch design, with a nice balance between rustic and elegant, made from brown leather with contrasting gold double stitching. 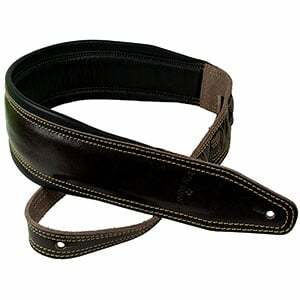 It is made from premium grade leather with a 3.5” width, while the strap is adjustable from 43.5” to 56”. With a soft feel and firm padding, it makes for a very comfortable stage partner, whatever your instrument. This strap from Planet Waves features the brand’s trademark visual appeal along with some performance-friendly innovation. 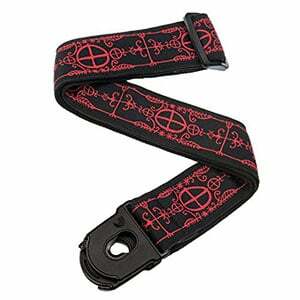 Available in several striking designs – including voodoo, tribal, barbed wire, and Gothic crosses – this fully-adjustable strap (35” to 59.5”) long is made from durable woven nylon and feels comfortable sitting on the shoulder. This feeling of security is tripled when you consider the end pieces are made of plastic and lock firmly onto your strap buttons, meaning no slip-offs. An all-round decent price and a solid choice for the stage performer. Made in America and crafted from a durable neoprene, this innovative strap boasts the ability to make a guitar feel half as light as it is, which takes some of the strain off your shoulder – ideal for long playing sessions. Although it’s certainly not the most stylish on this list, the Neotech Mega Strap is a very comfortable offering, with a generous width and added memory foam layers for increased comfort. It’s available in long, mid-size, regular or short sizes, with full adjustability in all sizes (36” to 45” in the regular). Ever wondered what happens to old seatbelts? We can’t speak for every one of them, but some definitely make their way into Souldier’s guitar straps! The American brand recycles seatbelt material, leading to a very strong strap for electric, bass and acoustic guitars. Of course, the seatbelt offers a unique look, which is available in a rainbow of colors, ranging from black and white to lime green and royal blue. This eco-friendly strap is comfortable to wear, fully adjustable (from 30” to 60”) and features thick leather ends, all put together by hand in Chicago. As you’ll have seen above, you can rely on Planet Waves to add a little extra visual appeal to your stage performances, as the brand offers a wide range of eye-catchingly edgy designs. Their fully-adjustable (35” to 59.5”) woven nylon strap features a range of black and white themes, from skull and crossbones, blossom tattoo, snakeskin, and digital camouflage. It feels comfortable to wear, while the durable leather ends offer a secure fit to most guitars. For punk, rock and metal players in particular, this makes a decent affordable option for the extroverted performer. This attractive strap is a very affordable but solid offering from Fender and something a little different to the basic all-black straps that dominate the budget market. The strap itself is made from a quality tweed material, which offers a comfortable feel, great strength and cool retro visuals. It is fully adjustable (from 44” to 49.5”) and features genuine leather ends which fit snugly to the guitar’s strap buttons and feature Fender’s cool F logo in gold. Naturally it would look great attached to a vintage or reissue Strat! There’s certainly nothing luxury about this affordable strap but – compared to others in the budget price range – this one from Protec impresses. Made of a quality nylon which feels reassuringly thick and robust, it comes in a range of colors including black, blue, white, red and purple, offering something for all styles. It features two leather ends which fit securely to most guitars and also includes a discreet pick pocket, allowing for easy pick access on stage or in practice. For under ten bucks, it’s hard to complain and a great choice for beginners. Guitar straps are so much more than just a bit of material – they come in all kinds of shapes, designs, materials and constructions. Considering how vital they are to players performing and practicing – both standing and sitting – it’s worth looking at what features you may want to consider before buying a new strap. Nylon, leather, tweed, cotton, linen, hemp, vinyl, suede, neoprene… guitar straps are made from many different materials, all with their own benefits. For example, nylon and vinyl straps are both cheap to produce, are strong and pretty comfortable. Cotton and linen straps both look unique and offer superior comfort and feel (although they can get dirty quite easily if you aren’t careful). Leather tends to be the most comfortable and durable strap material, but also the most expensive. Regardless of the material of the main length of the strap, it is the end pieces that can make or break the strap’s durability and reliability. While a cheap strap with synthetic ends may be a decent first-time purchase (or very often something that is included with a beginner’s guitar kit, it will be much less reliable than a strap with leather ends, as leather is hardwearing and less likely to tear, stretch or slip off the strap buttons. So, leather strap ends are a good way to go when reliability is important, as are locking straps or strap locks (see below). Nylon straps tend to offer good comfort straight from the box, but nothing beats the feeling of an old leather strap. As we mention above, leather is a comfortable material, but – just like a good pair or leather shoes or a leather jacket – a genuine leather strap can take a while to properly break in. On the subject of comfort, look out for straps that offer padding on the shoulder (or the entire length), which can be a huge comfort boost when playing for longer period of time – especially standing up. These can help reduce the weight on your shoulder, which in turn can help reduce back and shoulder pain. Pretty much all straps will vary in length, as most straps will offer an adjustable buckle. 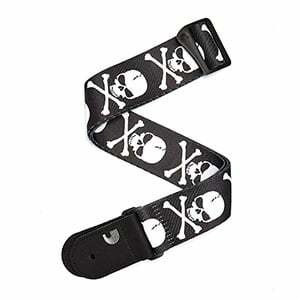 These buckles allow you to fine-tune the length of the strap for your size. Longer straps are better if you are tall, while shorter straps work well for shorter players and youngsters. In general, straps offer adjustability from around 30” to 60”, although for most adult players, anything around 50” is a common length. When it comes to width, most straps are between 2” and 3”, with bass guitarists often using a wider 4” strap. All brands offer straps of different prices. For example, a basic black nylon strap can be picked up for around $3, while you can spend well over two hundred bucks on a branded leather strap. The straps on our list – and the most popular purchases – come in at under $40, which is probably the maximum you should pay, unless you want a premium branded strap from the likes of Levy’s, Gibson, Martin or Taylor. 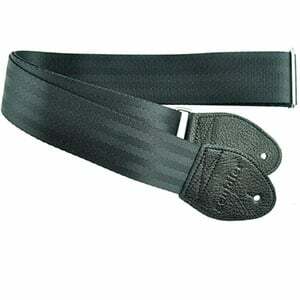 The design of a strap is another hugely important factor for many guitarists. The strap needs to fit the style of your guitar and the style of your band (if relevant). You probably wouldn’t want to play with a Hello Kitty strap if you are rocking a premium Ibanez in a metal band, just as much as you wouldn’t want a strap emblazoned with fire-breathing skulls if you play a vintage Tele in a country band. Thankfully there are literally thousands of choices out there, so you shouldn’t have a problem finding one you like. On the subject of style, if you are really keen on landing your dream strap, but just can’t find it, you can simply design your own. It is relatively simple to order a custom strap featuring the design of your choice. This can be brilliant for individuality, as you can pretty much guarantee nobody else will have your strap. The disadvantages of custom straps are the fact that they take longer to arrive and come with a higher price tag, for obvious reasons. These two entirely different things have the same function. Strap locks are small devices you purchase in addition to a strap. 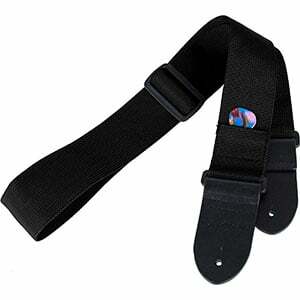 You simply slip these over the strap button of your instrument after the strap has been attached to lock it in place. These are relatively cheap and a great purchase for stage performers who want the most reliability. Alternatively, you can buy a locking strap, where the locking technology is already integrated into the end pieces of the strap. These end pieces fit onto your strap buttons as usual but will lock the strap in place, ensuring it isn’t going to accidentally slip off the guitar when you are jumping around on stage. Even though they are relatively inexpensive items, it’s well worth doing some research on straps before diving in, because buying the right one for you initially will save you buying twice. If you are unsure, stick with a model on our chart or a model with great online reviews, as this usually means the strap is good quality and a worthwhile purchase.